If you're looking for a beautiful oak fire surround, We have the perfect solution for you. With vast experience in the oak trade and a helpful team of UK specialists, we can create the perfect oak fire surround to add some wow factor to your home. We offer a range of oak fire surrounds in many styles and finishes so you can choose the perfect look for your home. Gorgeous timber adds a really lovely rustic feel to your interior design. Whether it's an old cottage, a high-end apartment or a cute terrace, a traditional wood fireplace is the perfect way to add some natural warmth to your space. A large traditional beam above the fireplace is a great way to display your favourite items, and it's a stunning focal point for the room - also perfect for hanging your Christmas stocking on! 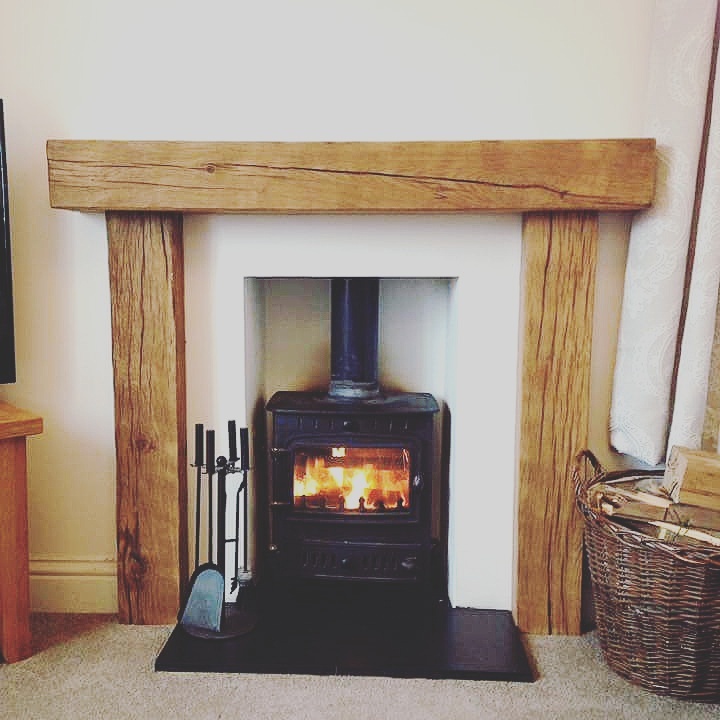 Whether you have a traditional open fire, woodburner or a more modern look, our stunning beams add warmth and a gorgeous rustic finishing touch. Using large, traditional beams is a great way to match contemporary style with beautiful natural materials. If you're looking for loads of character our aged timber has knots, splits and texture that provides a really bold finish. With years of experience and experimentation, we've perfected our finish so you know your fire surround is finished to the very best standard. All of our beautiful surrounds are hand worked in the UK and we only use the very best quality timber for your home. Whatever space you have, we can cut and finish your fire surround to your exact requirements, with help and advice from our friendly team. We're happy to work with you to design and create the perfect fit for your home. Just contact us for more information or check out our online shop to see what we've got to offer.